The still today intact Medieval village of Zeri lies inside its ancient ring of walls. 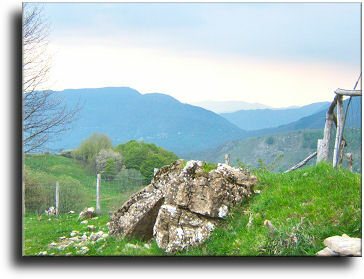 The landscape is dominated by the Apuane Alps that are connected to the Tuscan and Emilian Apennine by the so-called hogback of the Nuda. Between X-th and XIII-th centuries the village was populated by craftsmen, farmers and merchants who carried out their activities and today it is still possible to see the typical Medieval workshops and revived the characteristic scenery of the Medieval market that promoted a great growing, richness and prestige to the town. Coming into the village one might enjoy a long walk through steep paths, with a typical stone-made paving, by them large staircases elevate leading to the private houses. In a wonderful atmosphere noble palaces and fine monuments can be admired, marked by the features of the past of a village quarreled among the close towns for a long. In the heart of the village stand out some famous buildings like the Mary�s Nativity Church and the Our Lady of Lourdes Sanctuary, the most ancient buildings of the town.